My local development environment consists on several concrete CiviCRM installations, which usually reflects a clients system. Usually it is my client who discovers a bug and its usually me who will report the bug in the issue database and will fix it. When I have reported the bug I will fix the bug in the install of the client. This way I and the client can test the solutions. After the testing is done we want to commit the bugfix back to the community. That is what is discussed in this tutorial. This tutorial assumes you have already created a ticket in the CiviCRM Issue database and probably discussed the proposed solution on the forum. This tutorial also assumes you have some experience with git and github. 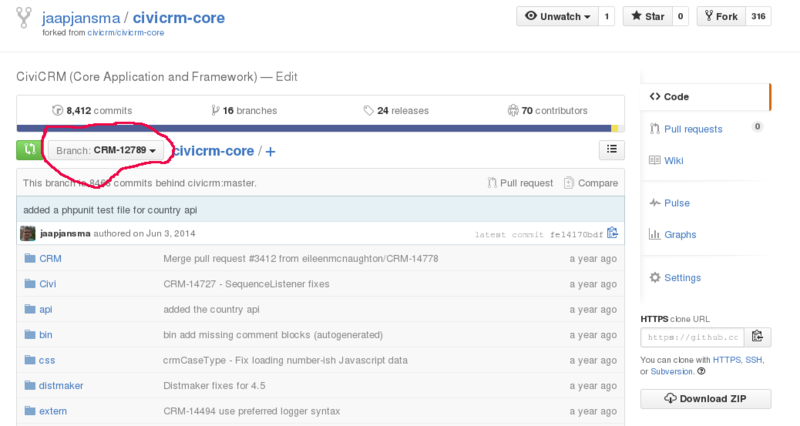 The CiviCRM Core repository consists of several branches. Each branch is for a major version. E.g. the LTS is in the branch 4.4. The master branch is the latest development which will probably result in the next major version. The first thing you have to do is determine in which version you fix have to occur. When I fix a bug in the install of client, I note what I have fixed. Usually its only a few lines of code. 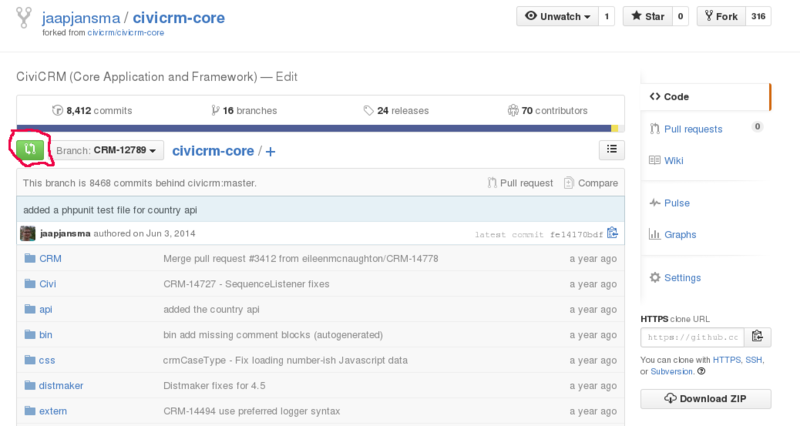 What I want to accomplish is that those lines of code are integrated in the next version of CiviCRM. In the issue database you could see what versions are affected by the bug and in what version it should be fixed. First you have to create a fork of the CiviCRM Core repository. You go to https://github.com/civicrm/civicrm-core and you press the button (in the screenshot below in the right upper corner). Github will then ask where you want to fork this repository. My advice is to fork it to your personal github account. This is the repository where you would commit your bugfixes to. Before you can submit bugfixes from your local development environment. You have to clone your personal CiviCRM Core fork. After that you have the CiviCRM core repository on your local development environment. After you have cloned your personal CiviCRM Core fork. You want also retrieve the latest changes in the CiviCRM Core repository. This what is usually called upstream. $ git commit -m "Fixed #CRM-12345: changed typo in readme"
After you have pushed your bugfix branch to your personal fork of CiviCRM Core you could create a pull request. The select the branch you want to merge to. Which is should match the branch on which your fix is based. E.g. in our example it is the 4.4 branch. 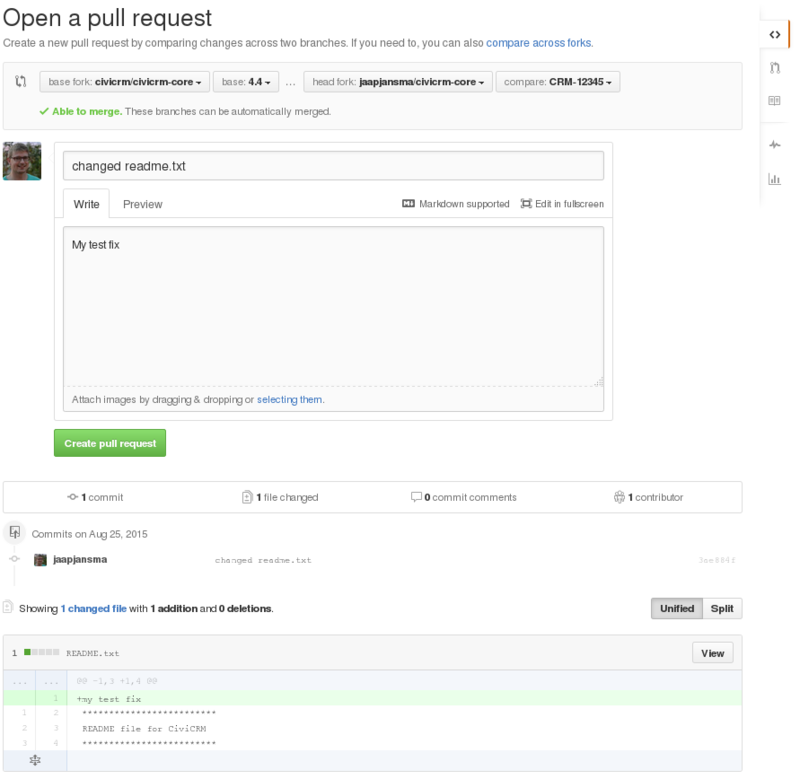 Add a message and click on create pull request. That is it. 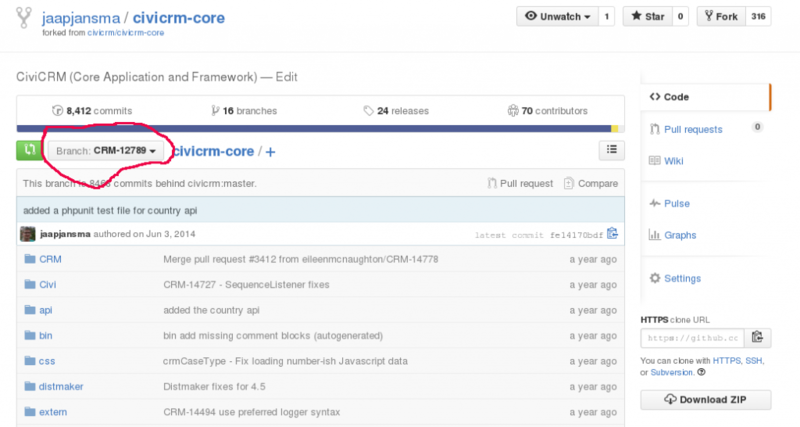 It is now time for the core team to merge your fix into the right branch of civicrm core.